This summer, I have the absolute pleasure of tutoring one of my former students, J. I wanted to review the alphabet with him, but I wanted to do it in a fun way. I decided to use my old Foam Floor Alphabet & Number Puzzle Mat . You could also do this with blocks or other alphabet toys. J was so excited to show his mom and brother what he had done. And I was excited to find a new use for my foam letters and numbers. 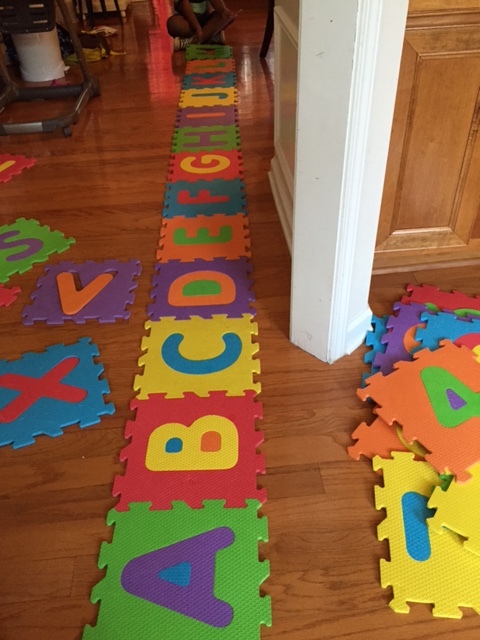 Can you think of some other fun ways that I could use the foam letters and numbers? Fun! Sounds like we are doing similar stuff (just did a post about our spelling exercises) all though we don’t have foam letters. But we have blocks which we can take out, thanks for the reminder!